Source: Received ebook copy from author. 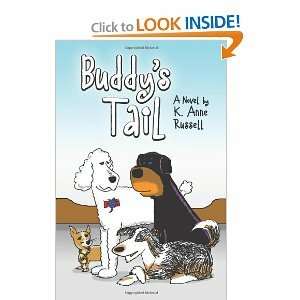 Buddy's Tail is one of those books that touch your heart. Buddy is a standard poodle. He has several buddy dogs, Mackenzie a border collie who narrates the story, Javier a little Chihuahua who may be small in stature but big in heart. Buddy's owners are selling their house. One of the prospective buyers meets Buddy and falls in love with him. She wants him but for unknown reasons she leaves without him. It is Buddy's dream to live with this woman. Buddy's owners try to sell him. He makes a mistake and is brought back. This happens several times and each time he is returned in worse condition and the owners are angrier. Buddy's best friend Mackenzie sneaks him food until she is killed. When she reaches Haven, her one desire is to return to earth to help Buddy. She is forbidden but given and opportunity to help him if she admits she is dead and agrees to stay in Haven. See all dogs in Haven have free will. Buddy's life takes a turn for the better and his dream comes true. He is able to help many other dogs on earth. When his time is up and he goes to Haven he becomes one of the best dogs to guide others to Haven. Then he makes a series of mistakes that could have terrible consequences. This was one of the best books for children I've read in a long time. It teaches the lesson that some times the rules for doing good are not necessarily black and white. I look forward to this becoming a print book so I can put it on my shelves at school. I also look forward to reading more from this author.